In the past decade, positron emission tomography (PET) with carbon-11-labeled Pittsburgh Compound B (PIB) has revolutionized the neuroimaging of aging and dementia by enabling in vivo detection of amyloid plaques, a core pathologic feature of Alzheimer's disease (AD). Studies suggest that PIB-PET is sensitive for AD pathology, can distinguish AD from non-AD dementia (for example, frontotemporal lobar degeneration), and can help determine whether mild cognitive impairment is due to AD. Although the short half-life of the carbon-11 radiolabel has thus far limited the use of PIB to research, a second generation of tracers labeled with fluorine-18 has made it possible for amyloid PET to enter the clinical era. In the present review, we summarize the literature on amyloid imaging in a range of neurodegenerative conditions. We focus on potential clinical applications of amyloid PET and its role in the differential diagnosis of dementia. We suggest that amyloid imaging will be particularly useful in the evaluation of mildly affected, clinically atypical or early age-at-onset patients, and illustrate this with case vignettes from our practice. We emphasize that amyloid imaging should supplement (not replace) a detailed clinical evaluation. We caution against screening asymptomatic individuals, and discuss the limited positive predictive value in older populations. Finally, we review limitations and unresolved questions related to this exciting new technique. 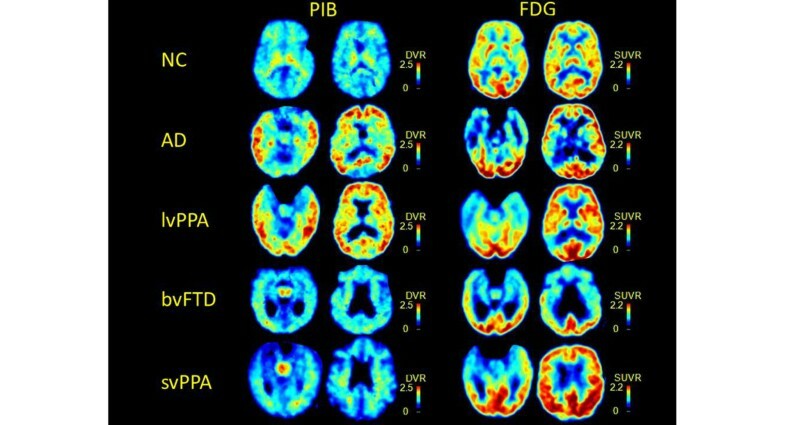 Positron emission tomography (PET) with amyloid ligands has revolutionized neuroimaging of aging and dementia in the past decade by enabling the detection and quantification of amyloid plaques, a core pathologic feature of Alzheimer's disease (AD) . The first specific tracer for amyloid-beta (Aβ) applied in human studies was carbon-11 (11C)-labeled Pittsburgh Compound B (PIB). PIB is an analogue of thioflavin-T that, at PET tracer concentrations, binds to fibrillar Aβ deposits with high sensitivity and specificity [2, 3]. PIB binds to both extra-cellular amyloid plaques (composed primarily of the Aβ 1-42 peptide (Aβ1-42)) and vascular amyloid deposits (consisting mainly of Aβ 1-40 peptides) . 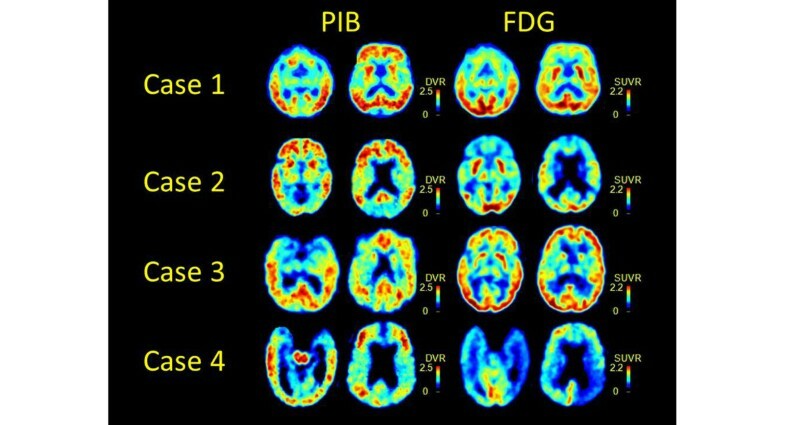 At PET tracer concentrations, PIB does not bind to non-Aβ inclusions such as neurofibrillary tangles or Lewy bodies [5, 6] or to brain homogenates from patients with non-Aβ dementia . PIB-PET has rapidly become an integral part of research studies on cognitive aging and the evolution of AD. The 20-minute half-life of 11C, however, limits its use to research centers equipped with a cyclotron, and precludes widespread clinical application. More recently, a second generation of amyloid tracers labeled with fluorine-18 (18F, 110-minute half-life) has been developed, making it feasible to produce and distribute amyloid tracers for clinical use . Three 18F amyloid imaging agents are in advanced stages of development: flutemetamol, a 3'-fluoro analog of PIB; florbetapir, a styrylpyridine derivative; and florbetaben, a derivative of stilbene. These tracers have performed comparably with PIB in clinical populations, although nonspecific white matter binding appears to be higher [9–11]. PIB, florbetapir and flutemetamol have been validated prospectively compared with the autopsy diagnosis of AD, and in vivo tracer binding of all three shows high correlation with postmortem measures of fibrillar Aβ [3, 9, 12]. In addition to research applications, amyloid imaging has great potential as a diagnostic tool because it directly detects a core feature of the molecular pathology of AD. This stands in contrast to currently available diagnostic imaging techniques in dementia, which detect the down-stream effects of pathology on the brain, such as synaptic dysfunction (fluorodeoxyglucose (FDG)-PET) and neuronal loss (magnetic resonance imaging (MRI)/computed tomography) - events that are thought to occur late in the disease cascade . Indeed, the clinical utility of amyloid tracers is currently being debated by regulatory agencies . In the present review, we focus on potential clinical applications of amyloid imaging. We summarize the literature on amyloid imaging in a range of neurodegenerative conditions, most of which consists of PIB studies. Data from 18F tracer studies are presented when available. We restrict our review to tracers that specifically bind to Aβ, and therefore do not discuss fluoro-dicyano-dimethylamino-naphthalenyl propene, a tracer that binds to a number of pathologic inclusions that have an amyloid conformation . We comment on the potential clinical utility of amyloid PET in a variety of clinical scenarios, and provide examples from patients enrolled in a study of amyloid imaging at our institution. Finally, we summarize our recommendations for clinical use of amyloid imaging, and discuss limitations and unresolved questions related to this exciting new technique. Most cognitively healthy normal controls (NC) do not show appreciable amyloid tracer binding (Figure 1). Elevated PIB binding is found in 10 to 30% of NC [16, 17], however, and this is similar to observed rates of amyloid pathology in autopsy studies of normal aging . In some cases, the extent and distribution of amyloid pathology in NC is indistinguishable from that found in AD . Increasing age and the presence of the apolipoprotein E ε4 allele (ApoE ε4) are the major predictors of PIB-positivity in NC [17, 20]. Indeed, PIB binding is found in 18% or less of subjects below the age of 70, in 26% of individuals aged 70 to 79 years, and in 30% of those aged 80 to 89 years. ApoE ε4 increases the overall prevalence of positive scans from 21% in noncarriers to 49% in carriers, and shows dose and age effects. PIB-positivity in NC has also been associated with a family history of AD, and with subjective cognitive impairment [21, 22]. 18F findings in NC have largely been in agreement with PIB findings showing similar prevalence, and relationships with age and ApoE [9–11, 23]. Amyloid tracer binding. Typical 11C-labeled Pittsburgh Compound B (PIB) binding and 18F-fluorodeoxyglucose (FDG) hypometabolism patterns in normal controls (NC), Alzheimer's disease (AD), logopenic variant of primary progressive aphasia (lvPPA), behavioral variant frontotemporal dementia (bvFTD), and semantic variant of primary progressive aphasia (svPPA). DVR, distribution volume ratio; SUVR, standardized uptake value ratio. The significance of a positive amyloid scan in a cognitively normal individual is uncertain. Some studies have found negative correlations between PIB and episodic memory in this population [16, 24], while other studies found no differences across cognitive measures between PIB-positive and PIB-negative controls . More consistently, cross-sectional studies have found AD-like structural and functional brain changes in PIB-positive NC, such as hippocampal and temporo-parietal atrophy [24, 26] and decreased resting-state connectivity in the default mode network [27, 28]. Two retrospective studies reported an association between PIB-positivity and declining cognition [29, 30]. In the largest prospective cohort, PIB-positivity was associated with declining memory and visuospatial performance , and was the strongest predictor of functional decline (conversion from clinical dementia rating of 0 to 0.5 or 1) . These cross-sectional and early longitudinal data have strengthened the notion that many (although probably not all) PIB-positive NC are in a preclinical phase of AD , but this hypothesis requires further longitudinal investigation. From a diagnostic perspective, the significant baseline rate of amyloid-positive NC emphasizes that amyloid-positivity is not synonymous with AD, and that amyloid scans cannot be interpreted in lieu of a detailed clinical evaluation. The true baseline rate of amyloid positivity in the general population is difficult to estimate, since current data are based on highly selected convenience cohorts that are probably enriched for AD. Given the strong association between age and PIB, it is likely that the positive predictive value of amyloid PET will be higher in younger patients. At present there is no clinical indication for amyloid imaging in cognitively normal individuals. But this will remain an area of active research in coming years, particularly with the advent of amyloid lowering therapies which might be most effective if initiated in the presymptomatic disease stage . Current data suggest that amyloid imaging provides prognostic information in patients with mild cognitive impairment (MCI), presumably by identifying patients with underlying AD pathology [35, 36]. As a group, 52 to 87% of MCI patients show elevated PIB binding in a similar regional distribution to AD [16, 37]. Patients meeting criteria for MCI of the amnestic subtype may be more likely to be PIB-positive than patients with nonamnestic presentations . 18F tracer studies report similar findings, with positive scans found in 45 to 60% of MCI patients [10, 11, 23]. In longitudinal studies, 1-year conversion rates to AD range from 33 to 47% in PIB-positive MCI subjects versus virtually no conversions in PIB-negative subjects [38, 39]. In the largest longitudinal effort to date , authors compared baseline amyloid deposition between MCI converters and nonconverters in 31 MCI subjects followed over 3 years. Overall, 55% of MCI subjects had increased PIB retention at baseline. The overall conversion rate was 82% in those with increased PIB uptake, but only 7% in PIB-negative subjects. Forty-seven per cent of PIB-positive subjects converted within 1 year, and these early converters showed higher tracer retention in the anterior cingulate and frontal cortex than late converters. Altogether, PIB-positive patients with MCI of the amnestic subtype are likely to have early AD, and amyloid imaging will probably have an important role in risk stratification and selection of patients who may benefit from disease-specific therapies. While amyloid PET is likely to predict whether a patient will convert from MCI to AD, structural/functional imaging and cognitive tests may be better predictors of when an individual will convert . This hypothesis is based on a model in which amyloid aggregation is an early event in AD that reaches a relative plateau even at the MCI stage, while downstream biomarkers measure neuronal loss and dysfunction, and cognitive measures are more dynamic at the symptomatic disease stage . New consensus diagnostic guidelines for MCI make a distinction between biomarkers of Aβ deposition (amyloid PET or cerebrospinal fluid (CSF) Aβ1-42 levels) and biomarkers of neuronal injury (for example, CSF tau, hippocampal/medial temporal atrophy on MRI, hypometabolism on FDG-PET) . Biomarkers from both categories are used in conjunction with core clinical criteria to assess the likelihood that MCI is due to underlying AD. If both Aβ and neuronal injury markers are positive, a diagnosis of MCI due to AD-high likelihood can be made. Conversely, if markers from both categories are negative, MCI is considered unlikely due to AD. If one marker is positive and the other untested, the likelihood of AD is intermediate - while biomarkers are considered uninformative if they provide conflicting information. Stratifying MCI patients into those with and without underlying AD may represent the major clinical use of amyloid imaging. MCI is a common condition, but clinical certainty regarding the underlying histopathology is low (as evidenced by the significant percentage of classical MCI patients of the amnestic subtype who are PIB-negative). As with studies of normal aging, the generalizability of MCI studies based on highly selected research cohorts is questionable because these cohorts are enriched for AD and often exclude patients with comorbid illnesses that impact cognition (for example, cerebrovascular disease, major organ failure). Amyloid imaging will also be helpful in selecting MCI patients for clinical trials of AD-specific treatments initiated at the predementia state. Most studies have found that PIB-PET has very high (90% or greater) sensitivity for AD [17, 42]. Tracer binding is diffuse and symmetric, with high uptake consistently found in the prefrontal cortex, precuneus and posterior cingulate cortex, followed closely by the lateral parietal, lateral temporal cortex, and striatum (Figure 1). This pattern closely mirrors the distribution of plaques found at autopsy . Similar to what has been reported in NC and MCI, amyloid aggregation appears to be higher in ApoE ε4 carriers  - although this association is not always found in patients at the dementia stage . Correlations between amyloid load and cognitive measures or disease severity are generally weak or absent [16, 46]. Longitudinal studies in AD are relatively few and have offered conflicting results, with some studies reporting minimal longitudinal change [47, 48] and others reporting average annual increases of up to 5% in AD patients . Regardless of whether PIB binding plateaus or continues to increase slowly at the dementia phase, brain atrophy and hypometabolism accelerate at this phase and correlate more robustly with disease severity and clinical progression [25, 46]. Few studies have applied amyloid imaging to atypical clinical presentations of AD. One study demonstrated the feasibility of detecting AD pathology in middle-age persons with Down's syndrome . PIB-PET was used to demonstrate that amyloid deposition is more common in the logopenic variant of primary progressive aphasia (PPA) than in nonfluent or semantic variants [50, 51], supporting the hypothesis that the logopenic variant of PPA is predictive of underlying AD. Several studies have detected high PIB binding in patients with posterior cortical atrophy, a visuospatial/biparietal clinical syndrome often caused by AD [52–54]. Although single case reports and small series initially reported atypical binding patterns in PPA and posterior cortical atrophy , larger series have found a diffuse binding pattern in these syndromes that is indistinguishable from typical AD and dissociated from the focal structural and metabolic signatures of these syndromes (see PIB and FDG in AD vs. logopenic variant PPA in Figure 1) [50, 51, 53, 54]. Similarly, a study comparing PIB binding in early and late age-of-onset AD found that differences in cognitive profiles (more global deficits in early-onset AD, and restricted amnesia in late-onset AD) could not be explained by the distribution or burden of PIB, which was identical in the two groups . New AD diagnostic guidelines adopt a similar framework to the new MCI guidelines and distinguish between biomarkers of Aβ deposition and neuronal injury . Clinical and biomarker information is used in conjunction to modify the probability of underlying AD pathophysiology. Three main categories are proposed: probable AD dementia, possible AD dementia (atypical clinical presentation), and probable or possible AD dementia with evidence of AD pathophysiological process. In typical clinical presentations, if both categories of biomarkers are positive, the likelihood of AD pathophysiology is considered high. If only one of the two categories is positive, then the probability is intermediate. Atypical clinical presentations are considered at high probability of an AD pathophysiological process if both categories of biomarkers are positive, although a second etiology cannot be excluded. Finally, dementia is considered unlikely due to AD when both categories of biomarkers are negative. Amyloid imaging will probably not add value to the diagnostic work-up of patients with straightforward clinical AD, as these patients are very likely to have positive scans. This technique is likely to be useful in patients with focal cortical syndromes such as PPA and posterior cortical atrophy, as these are pathologically heterogeneous syndromes that are variably associated with underlying AD. Similarly, amyloid PET could be useful in patients with early age-of-onset dementia, as these patients often present with atypical symptoms (for example, executive, behavior, language and visuospatial rather than memory), and the main alternative cause of dementia in this age group is frontotemporal lobar degeneration (FTLD), a non-Aβ disease. The low rate of amyloid-positive nondemented individuals in this age group will increase the positive predictive value of amyloid scans. PIB binds to vascular amyloid deposits in animal models and postmortem human tissue [2, 4, 6]. Nondemented patients with cerebral amyloid angiopathy show high PIB binding compared with controls . Although overall PIB binding is lower than in AD, cerebral amyloid angiopathy patients show a higher occipital-to-global PIB ratio, concordant with the occipital predilection of cerebral amyloid angiopathy at autopsy . PIB may be useful for stratifying patients with microhemorrhages into those with underlying cerebral amyloid angiopathy and those in which hemorrhages are due to small-vessel vasculopathy, particularly when the anatomic distribution of hemorrhages is ambiguous (for example, both lobar and deep gray matter). This distinction may impact decisions regarding anticoagulation. It may also be important to distinguish AD patients with and without a significant burden of cerebral amyloid angiopathy, as the latter may be at higher risk for complications from amyloid modifying therapies . It is not yet clear whether PIB will be useful for this purpose (for example, based on occipital to global binding ratios) or add value to MRI sequences that are sensitive to microhemorrhages . Vascular dementia can be difficult to differentiate from AD on clinical grounds . The two share risk factors, are often comorbid, and may interact biologically. Few studies have applied amyloid PET to patients with suspected vascular dementia. One study found that 69% of patients clinically diagnosed with subcortical vascular dementia were PIB-negative . Younger age and a greater number of lacunes predicted a negative PIB scan. Another study found high PIB binding in 40% of patients with post-stroke dementia . PIB-positive post-stroke patients declined more rapidly on the Mini-Mental State Examination (MMSE) than did PIB-negative patients. Altogether, amyloid PET will probably have a clinical role in identifying cognitively impaired patients with high vascular burden who also have comorbid AD (and thus may benefit from AD treatments), and will further our understanding of how AD and vascular disease interact and contribute to cognitive decline in the aging brain. The percentage of PIB-positive scans in patients with dementia with Lewy bodies (DLB) has ranged between 30 and 85% in small case series [63–67]. Similar variations have been reported in Parkinson's disease dementia (15 to 100% PIB-positive). PIB scans were negative in two patients with multiple system atrophy , and florbetaben-PET was negative in five patients with Parkinson's disease without dementia and positive in 29% of clinically diagnosed DLB patients . These differences may be explained both by cohort factors and by the method of defining scan positivity (for example, qualitative vs. quantitative, thresholds, and so forth). The pattern of binding in DLB and Parkinson's disease dementia is similar to AD, although overall binding is lower with higher intersubject variability. Most studies have found higher amyloid plaques in DLB than in Parkinson's disease dementia or nondemented Parkinson's disease patients, and in some studies PIB-positivity was associated with greater cognitive deficits and more rapid disease progression . Overall, these findings are concordant with autopsy-based studies on the frequency and impact of Aβ plaques in DLB and Parkinson's disease dementia . In vitro and postmortem studies suggest that the in vivo PET signal in synuclein disorders reflects PIB binding to Aβ deposits rather than to Lewy bodies [2, 5]. Given the high frequency of amyloid plaques and generally high rates of positive amyloid scans in DLB, it is unlikely that amyloid PET will be helpful in differentiating DLB from AD. Amyloid PET may differentiate Parkinson's disease or Parkinson's disease dementia from AD, but this differentiation can usually be accomplished clinically. Further work is needed to determine whether amyloid PET can provide prognostic information in synuclein disorders. FTLD is an umbrella term used for disorders associated with neurodegeneration of the frontal and anterior temporal lobes . Clinical syndromes that fall in the FTLD spectrum include the behavioral variant of frontotemporal dementia (bvFTD), frontotemporal dementia with motor-neuron disease, and the semantic and nonfluent variants of PPA [71, 72]. Histopathology in FTLD is heterogeneous, with most cases featuring tau (Pick's disease, corticobasal degeneration and progressive supranuclear palsy), TDP-43 or fused-in sarcoma protein inclusions . FTLD and AD are the leading causes of early age-of-onset dementia, occurring with similar frequency in patients presenting younger than the age of 65 . Distinguishing the two during life can be challenging due to clinical and anatomic overlap, and misdiagnosis rates of 10 to 40% are reported even in expert centers . Differentiating AD from FTLD is an important clinical use for amyloid PET, since Aβ plaques are not part of the FTLD pathologic spectrum, and the differential diagnosis comes up in young patients in whom age-related amyloid aggregation is less common. Small case series reported low rates of PIB (0 to 15%) and florbetaben-positivity (9%) in FTLD (see bvFTD and semantic variant PPA in Figure 1) [11, 67, 76]. Differentiating AD and FTLD was the focus of the largest study on the diagnostic utility of amyloid PET published to date . In 62 AD patients and 45 FTLD patients matched for age and disease severity, PIB visual reads had a higher sensitivity for AD than FDG-PET (89.5% vs. 77.5%), with similar specificity (83% vs. 84%). When scans were classified quantitatively, PIB had higher sensitivity (89% vs. 73%) while FDG had higher specificity (83% vs. 98%). PIB outperformed FDG in classifying 12 patients with known histopathology (97% vs. 87% overall accuracy). PIB visual reads also showed higher inter-rater reliability and agreement with quantitative classification than FDG, suggesting it was the more accurate and precise technique. Corticobasal syndrome (CBS) is sometimes included under the FTLD umbrella because of considerable clinical and pathologic overlap . While most cases of clinical CBS are associated with FTLD pathology (although not necessarily corticobasal degeneration), 25 to 50% of patients are found to have AD as the causative pathology postmortem [75, 77, 78]. Amyloid PET would theoretically be useful in identifying CBS patients with underlying AD, but clinical studies are lacking. In our center PIB was positive in a patient with CBS found to have AD/DLB at autopsy (see Figure 2, Case 4), while PIB scans were negative in two CBS patients with pathologically confirmed corticobasal degeneration (unpublished data). Clinically challenging cases imaged with 11 C-labeled Pittsburgh Compound B and 18 F-fluorodeoxyglucose. Autopsy diagnosis is available in three cases. See text for a description of the cases. FDG, 18F-fluorodeoxyglucose; PIB, 11carbon-labeled Pittsburgh Compound B; DVR, distribution volume ratio; SUVR, standardized uptake value ratio. Clinical symptoms and imaging findings suggestive of normal pressure hydrocephalus (NPH) overlap with those found in neurodegenerative diseases, and AD pathology is found in a significant proportion of patients clinically diagnosed with NPH . In some studies, the presence of AD pathology predicted poor response to shunting , prompting a few centers to routinely obtain cortical biopsies prior to shunting suspected NPH . Two studies have compared PIB-PET  or flutemetamol-PET  with frontal biopsy results in patients with suspected NPH. Combined, PET scans were positive in eight out of nine biopsy-positive patients, and negative in eight out of eight biopsy-negative cases. Strong correlations were found between regional tracer uptake and quantitative measures of Aβ in both studies. Further work is needed to determine the prognostic value of amyloid PET in the evaluation of NPH, and to study the proposed biological relationships between AD and NPH . PIB scans were negative in three small series featuring a range of prion disorders, including sporadic Creutzfeldt-Jakob disease, variant Creutzfeldt-Jakob disease, and a range of prion protein mutations [83, 84]. Genetic prion disease can occasionally present insidiously and mimic AD, while DLB can present as a rapidly progressive dementia and be mistaken for Creutzfeldt-Jakob disease. However, prion disease can usually be distinguished from Aβ-associated diseases on clinical grounds and based on characteristic MRI findings . A study of PIB in HIV-positive individuals found that cognitively impaired patients with HIV do not show high PIB binding (although some showed low levels of CSF Aβ1-42), suggesting that PIB may distinguish HIV dementia from AD, a diagnostic dilemma that will become increasingly relevant with an aging HIV-positive population . We have applied amyloid and FDG-PET to over 200 patients followed in dementia research cohorts at the University of California San Francisco Memory and Aging Center as part of an ongoing study on the utility of these techniques in differential diagnosis. Figure 2 shows PIB and FDG scans from four clinically challenging cases, described in the vignettes below. Case 1 is an 89-year-old man with 8 years of progressive memory loss, executive dysfunction, behavioral changes, and an MMSE of 29. MRI showed severe hippocampal atrophy as well as significant subcortical white matter disease and a number of lacunes. Clinical diagnosis was mixed AD/vascular dementia. FDG showed bifrontal hypometabolism sparing the temporo-parietal cortex, while PIB revealed diffuse cortical binding. Autopsy indicated high-likelihood AD (CERAD frequent/Braak stage 6) and moderate subcortical ischemic vascular disease. In this case, FDG alone could have led to a misdiagnosis of pure vascular disease or bvFTD (the latter less likely based on age), and treatment with a cholinesterase inhibitor may not have been offered. Case 2 is a 55-year-old man with 9 years of profound behavioral changes including compulsive behaviors, disinhibition, socially inappropriate behavior, and impairment in executive, memory, and visuospatial functions (MMSE = 16). He was clinically diagnosed with bvFTD. FDG showed bilateral frontal and temporo-parietal hypometabolism, while PIB revealed diffuse cortical binding. Pathology is not available. In this case, PIB provides a useful tiebreaker in favor of AD in an early-onset dementia patient in whom clinical features and FDG-PET are ambiguous between AD and FTLD. A cholinesterase inhibitor was subsequently started. Case 3 is a 70-year-old woman presenting with non-fluent variant PPA (MMSE = 28). FDG showed focal left frontal hypometabolism, while PIB was unexpectedly positive. On autopsy the patient was found to have both Pick's disease and high-likelihood AD (CERAD frequent/Braak 5). This case demonstrates that while PIB can accurately detect AD pathology, a positive amyloid scan does not rule out comorbid non-Aβ pathology, which in this case was FTLD, as predicted based on the clinical presentation and FDG-PET pattern. Case 4 is a 68-year-old man with 6 years of progressive asymmetric left-sided apraxia, Parkinsonism, dystonia, tremor, and myoclonus. Levodopa treatment was unhelpful. Cognitive decline was characterized by deficits in executive and visuospatial functions, episodic memory and language (MMSE = 19). Visual hallucinations emerged later in the course. Clinical diagnosis was CBS. FDG revealed asymmetric right posterior frontal and temporo-parietal hypometabolism. Pathological diagnosis was mixed high-likelihood AD (CERAD frequent/Braak 6)/intermediate-likelihood DLB. In this case, PIB correctly predicted underlying AD in a patient with a clinical syndrome (CBS) associated with varied histopathology. There are many unknowns that could impact the diagnostic utility of amyloid PET. First, the sensitivity and specificity compared with pathology are not yet well defined. Technical and patient factors that could lead to false positives and false negatives are not clear. PIB binds to both diffuse and neuritic plaques  (the latter being more common in normal aging), and the relative contribution of each to the in vivo signal has not been determined. It is not yet clear whether amyloid PET should be interpreted as a dichotomous test (that is, positive versus negative) or whether the degree and spatial distribution of binding offer additional diagnostic information. Studies examining inter-rater and intra-rater reliability of visual interpretations are few, and the optimal quantitative threshold for defining a positive scan has not yet been defined . Also not yet established is whether the threshold for PIB-positivity should be adjusted based on demographic factors such as age (as is done when scoring plaques at autopsy)  or genetic variables such as the ApoE ε4 genotype. Significantly, the relationship between amyloid and dementia is weaker in older versus younger individuals . The positive predictive value of a positive amyloid scan in determining the cause of dementia will therefore be lower in older individuals. In general, amyloid PET will be more useful in ruling out (given the high sensitivity for pathology) than in ruling in AD as the cause of dementia, since the detection of amyloid may be incidental or secondary to a primary, non-Aβ pathology in some cases (for example, Case 3 above). The ideal combination of biomarkers in the evaluation of dementia will probably depend on the specific clinical scenario. In general, the approach introduced in the new AD diagnostic guidelines (one marker specific for Aβ, another specific for neurodegeneration to establish AD as the probable pathophysiology) has face validity . However, one can imagine that an amyloid scan will add more diagnostic value to a structural image in a 60 year old with an atypical MCI syndrome and hippocampal atrophy (which may or may not be due to AD pathology) than in an 80 year old with clinically classical AD dementia and a clear temporo-parietal cortical atrophy pattern. A number of studies have evaluated the utility of combining amyloid scans with MRI  or FDG [89, 90], but these analyses have largely been limited to the MCI/AD continuum. Also, the relative diagnostic strengths of CSF versus amyloid imaging as molecular markers have yet to be determined. While amyloid tracer binding correlates highly with CSF Aβ1-42 levels across the AD continuum , how CSF AD biomarkers and amyloid imaging compare in differentiating AD from other causes of dementia remains to be seen. Initial studies suggest that CSF Aβ1-42 may be more sensitive than PIB to early amyloid pathology [20, 92], rendering CSF potentially more sensitive for early detection but less specific in determining the cause of dementia. The lack of specificity may be overcome, however, by applying a ratio of Tau/Aβ1-42 or phospho-tau/Aβ1-42 . Further head-to-head studies of amyloid PET and CSF are needed to clarify these points. For current practice, we recommend structural neuroimaging as the standard of care for ruling out nondegenerative causes of cognitive decline . A molecular marker (either amyloid PET or CSF) may have added value in particular scenarios, as discussed below. In some clinical scenarios, a nonamyloid molecular tracer may be preferred (for example, dopamine imaging for differentiating AD and DLB) . Ultimately, to be widely adopted a diagnostic test needs to have a significant impact on patient management and outcomes, and to be cost-effective. Few studies have examined these points with regard to amyloid imaging. In our clinic, PIB results have had implications for treatment, mainly affecting decisions about whether to initiate or discontinue AD symptomatic medications (see case histories). In practice, these medications are probably prescribed to a large number of patients with non-AD dementia, whereas certain populations that may benefit are currently not treated (for example, MCI due to AD) based on negative clinical trials that may have been confounded by biological heterogeneity . Such decisions would be more rational if amyloid PET was applied in the right circumstances, and this could result in cost saving. The more immediate impact of amyloid imaging will be in improving clinical trial design by enrolling patients based on biological, rather than clinical, phenotype. This is a necessary first step for the development and testing of disease-specific therapies. Initial studies have found that requiring a positive molecular biomarker for inclusion will render AD clinical trials more efficient and less costly, especially in early disease stages . In fact, a positive amyloid scan may be the primary inclusion criterion for a study focused on AD prevention. Recommendations for potential clinical applications of amyloid PET are provided in Table 1. These applications are based on our analysis of the data and our institutional experience, and represent an early attempt to guide clinicians in how to apply amyloid PET to their practice. The recommendations were formulated using the following principles: amyloid PET cannot be interpreted in the absence of clinical context (as is the case with any diagnostic test); amyloid PET will be most useful in differentiating Aβ from non-Aβ causes of dementia in scenarios in which this distinction is clinically challenging - these scenarios might include patients with mild symptoms (for example, MCI), cases presenting with pathologically heterogeneous clinical syndromes (for example, PPA, CBS), patients with early age-of-onset dementia, or cases with symptoms that could be explained by either Aβ processes or nondegenerative causes (for example, NPH, intracranial microhemorrhages); and, finally, some very important applications of amyloid PET should be restricted to research studies (for example, scanning asymptomatic or minimally symptomatic patients). In all situations, structural imaging using magnetic resonance imaging is recommended to rule out space-occupying lesions, inflammation, or other confounding conditions. AD, Alzheimer's disease; MCI, mild cognitive impairment. While amyloid imaging has produced an impressive body of research in a short time, studies of practical clinical applications for this technology lag far behind studies with more biological objectives. Since clinical use is now feasible and will probably be approved by regulatory agencies in the near future, it is imperative that the diagnostic performance, added clinical value, and cost-effectiveness of this technique be studied systematically and in populations more representative of real clinical practice. With all its limitations, amyloid imaging represents a major breakthrough in the evaluation of dementia that will doubtlessly translate into better clinical care, and will ultimately help guide the development of molecular-based therapies for these devastating illnesses. The authors would like to thank Dr WJ Jagust and Dr S Villeneuve for their review of the manuscript prior to publication. GDR is supported by grants from the National Institute on Aging (K23-AG031861) and the John Douglas French Alzheimer's Foundation. RL Jr declares that he has no competing interests. GDR received consulting fees from GE Healthcare, and receives grant support from Avid radiopharmaceuticals, a wholly-owned subsidiary of Eli Lilly and Company. Both companies are developing amyloid PET tracers for commercial purposes.